Florida may be the overall No. 1 seed in the NCAA mens basketball tournament, but the University of Tennessee is a much more valuable team, financially speaking. UT is a sparkling No. 15 on Forbes’ 2014 list of the most valuable college basketball teams, with a team value of $14.1 million and a profit of $8.5 million. 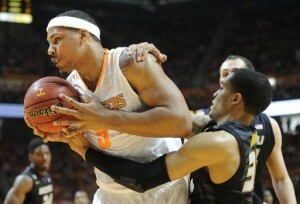 Among its Southeastern Conference foes, the Vols trail only Kentucky, NO. 3 on the Forbes list with a team value of $32.5 million. But UT is well ahead of the Gators who finished outside Forbes’ Top 20 with a team value of $10 million +. The financial details for the current rankings are from the 2012-2013 season and come from the U.S. Department of Education database, says Forbes, which published its 2014 list on Monday. Ticket sales, alumni contributions, parking and concessions and NCAA tourney payouts are among the revenue sources cited by Forbes. “Unlike our professional sports valuations, our college basketball values don’t represent what a team would sell for on the open market; as college teams, they obviously cannot be bought or sold. Instead, we use a weighted methodology to determine how much value the top college basketball teams generate for their athletic departments, universities and fellow conference members,” Forbes’ writer Chris Smith reports. No. 1 on the Forbes list for the third straight year is Louisville with a team value of $39.5 million and a sizzling profit of $24.7 million. The Vols lofty Forbes ranking continues to benefit from the tournament payout earned by the 2010 team, which made the NCAA Elite Eight and came within a whisker of the school’s first Final Four. The Vols play their first NCAA tournament game since 2011 on Wednesday when they go up against Iowa. Click here for the Forbes report. This entry was posted in UT Basketball and tagged alumni contributions, Chris Smith, concessions, Department of Educaion, Florioda, forbes, Gators, Kentucky, Louisville, most valuable college basketball teams, NCAA tournament, parking, ticket sales, tourney payout, University of Tennessee, Vols on March 18, 2014 by Roger Harris.